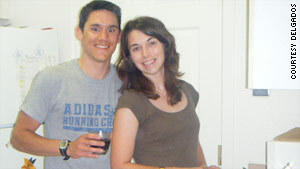 The fate of Alison, his wife, best friend and medical school classmate, depended on it. His usually steady hands quivered as he held her pale face steady and fumbled with the tools that could save her life. Her doe-eyes rolled to the back of her head. Through tears, he said, "I'm sorry, babe." Then, he stabbed her neck. Alison's eyes shot open. She gurgled in pain and weakly clawed at the tracheotomy tube that pierced her throat. It was November 21, 2010, and just a few minutes earlier, the newlyweds had climbed into bed. Married just six months and focused on their careers, the couple hadn't even had time to pick out wedding photos to frame for their new house. Now all that -- and more -- would be put on hold. They were getting ready to sleep when an aneurysm ruptured in Alison's brain, triggering a violent seizure. Without an airway tube to help her breathe, she could have choked on her own vomit and died. For Tim, a second-year medical resident, jamming a tube in his wife's neck without drugs "was the most difficult thing I ever had to do." What Tim Delgado experienced that night ranks as one of the greatest fears of people in the field of medicine -- that someday, the life they must save will be a loved one's. Incredibly, it was the second time Alison's life depended on Tim -- and on this day, he was going to keep his cool. For Alison, the night of her seizure is a blur. She doesn't recall the tracheotomy tube -- and it's probably better that way. Alison links her arm with her husband's on the couple's couch in their home in Cincinnati. On the wall above them, framed photographs chronicle the Delgados' adventures: the New Mexico mountains they climbed together, road trips to Wyoming, family gatherings. Alison and Tim Delgado started dating after their first year in medical school. Five years ago, Tim took note of his medical school classmate, Alison Bedingfield. A lifelong runner, Alison carried her lithe frame gracefully. She seemed easygoing to Tim. Her friends affectionately called her Ali-B. After microbiology lab one day, Tim asked her out. She agreed. He took her to the school gym. "That was really dumb," he says now, sheepishly. "It wasn't really a date." They treaded side-by-side on the elliptical machines and talked. The experience left Alison with a strong impression: Tim was "very intense." With dark eyes and closely cropped hair, Tim exuded energy. After a 12-hour shift in the hospital, he sometimes cycled for five hours. One summer, he followed the Tour de France course behind the pros. With its fast pace and high pressure, medicine was perfect for him. It also fit Alison's high-achieving personality. Even though Tim Delgado took Alison Bedingfield to the school gym on their first date, he got a second date. She was raised on cross-country running and the Midwestern value of hard work. She won the first marathon she ever ran. And she breezed through college, graduating early and entering the University Of Cincinnati College of Medicine in her hometown. Tim walked away from the first date with an impression, too: She was also intense. But he hesitated to ask her out again, because she seemed "too nice." A few months passed. Alison went on a medical students' white water rafting trip -- organized by Tim. At last, they realized how much they shared in common: They were two future doctors constantly on the move: Alison a runner, and Tim an avid cyclist. They were a team. Tim introduced Alison to sushi and taught her to use chopsticks. During long nights before exams, they huddled in a cold study hall, draped in blankets, and pored over their textbooks toting a space heater and French press coffee maker. In 2008, he dropped to one knee after a grueling bike ride up Lookout Mountain in Colorado and asked her to marry him. "We always said we're a team," Alison said. "That was our extra vows. We're a team and stay a team." Tim Delgado proposed to Alison on top of Lookout Mountain in Golden, Colorado, after a grueling bike ride. They married last May and started their new life together in a two-story white house on a quiet cul-de-sac. Alison, 27, became a pediatrics resident at the Cincinnati Children's Hospital Medical Center. Tim, 31, landed an emergency medicine residency at University Hospital in Cincinnati. He trained as a flight physician working in the emergency department. The high-stakes job involves taking care of patients in helicopters during the precious minutes between life and death. Tim was chosen for the competitive program because "he's imperturbable," said Dr. William Hinckley, Air Medical director at University Hospital. "He always keeps cool." The shift began much like many others in the emergency room. A few chest pains. Stomachaches. A woman who had accidentally stabbed her eye with a coat hanger. 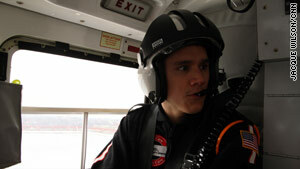 After a slow day in the emergency department, Tim Delgado was excited to be called to the helicopter. Tim tended to patients on that "mundane day," October 16, as electrocardiograms bleeped, phones rang, and patients shuffled back and forth from their rooms. Around 5 o'clock, the radio crackled, summoning him to the helicopter pad. "20-year-old cyclist struck by car. Female. Head injury." The victim had already been moved from the accident scene to a small hospital. Her injuries were extensive. She needed the more sophisticated resources of a facility like University Hospital, nine miles away. Tim rushed to the helicopter, his mind racing. He was still new to flying, with only 25 to 30 flights behind him, but he was joined by Deb Jump, a flight nurse with 10 years' experience. It took them just seven minutes to arrive at Mercy Hospital. They rushed to the patient's side. Tim glanced at her vital signs. She was in a coma. Her breathing was slow; her heart rate low. High blood pressure indicated an increasing strain on her brain. 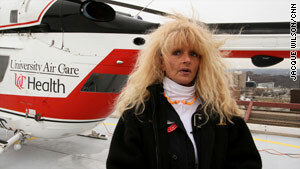 Deb Jump, an Air Care nurse, said the flight was the worst she has had in 10 years. 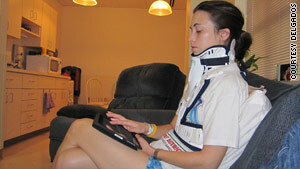 Her head was cushioned between two blocks with a collar to keep her neck steady. A breathing tube was in her mouth. As Tim assessed the situation, the patient's cycling uniform caught his eye. She wore a blue, yellow and green jersey that read "Team Hungry." That's my cycling team, he thought. His eyes inched up to the patient's face. He stepped back. The accident had mangled her jaw and splattered blood across her chin. Tim felt like he had been "stabbed in the gut." He leaned down to Alison and wept. She had gone for a bike ride that early evening on a winding road about 15 miles from their home. A Hyundai Sonata turned left at an intersection and careened into Alison. 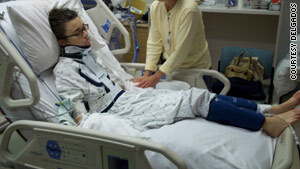 The impact catapulted her over the car roof, breaking her jaw, collarbone and sternum, and bruising her heart and lungs. The driver, cited for failure to yield, had waited with Alison for the ambulance. Now, the bleeding inside her skull was putting pressure on her brain. She needed to be transported immediately. "Deb, we have to get her to the university fast," Tim said, through tears, to the nurse. "We have to get her there." Alison Delgado had broken bones in her neck, bruised lungs and heart, and brain injuries. "I know, but we can't fly her there. You can't be her doc." Neither nursing school nor medical school had prepared them for this situation. There is no protocol for what to do when your spouse is your patient. The veteran nurse knew Tim was in no shape to take care of Alison. She called for another helicopter. Tim staggered out of the emergency room to regain his composure. Then his doctor's instincts kicked in. Alison needed sedatives to relax her brain. He walked back into the emergency room and, through tears, began ordering the drugs. Frazzled, he didn't realize he was recommending the wrong dose. Nurses silently administered the correct amount. His mind swirled in a thousand directions. He called his sister but couldn't find the words to explain what happened. Finally, another helicopter touched down. And with it, another doctor. Doctors didn't expect her to survive the first night. Alison Delgado has some issues thinking of the right words. She had hemorrhaging in the brain. A scan showed two aneurysms, or ballooning in the artery walls. It wasn't clear whether they existed before the accident or were caused by it. That night, as their families swarmed the hospital, Tim lay exhausted on the waiting room floor. He told his older sister that Alison couldn't die. He was too young to be widowed. They had more mountains to climb, a whole life awaiting them. Tim had proposed to Alison during a mountain bike ride. Their life together wasn't supposed to end because of a cycling trip. Little by little, the swelling in Alison's head decreased. The internal bleeding in her brain stopped. Alison had worn a helmet, and doctors believe that protected her. Five days after the accident, she awoke from the coma. She was delirious and agitated; she tried to crawl out of bed and pull out her feeding tubes. Grateful his wife was alive, Tim's concerns shifted to the next challenge. She couldn't move her right arm. Sometimes, she slurred her words and confused Tim's name with her brother's. "My biggest fear was that she would be neurologically devastated and lose the ability to communicate," Tim says, "that she wasn't going to be able to live the life that she worked so hard for." But there was reason to hope. After two weeks, Alison achieved a small but significant milestone: She clutched a spoon in her right hand and fed herself soup. Delighted by her progress, Tim told her, "Ali, I love you." "I wuv you, too," she replied. Alison remained hospitalized for 15 days, then transferred to an inpatient traumatic brain injury clinic. There, over the course of weeks, she relearned motor skills, regained her hand-eye coordination and taught herself words using children's flashcards on an iPad. Since her accident, Alison has had 12 surgeries to her brain, chest and jaw. Tim took a three-month leave to care for her. The Delgados exercise every day, working to restore Alison's strength. Alison's biggest setback was the seizure she had in November that forced her husband to insert the breathing tube. That incident put her back in the hospital for three weeks. She returned to the hospital Tuesday for a surgery to clip an aneurysm in her brain that may have existed before the accident. They hope to be back home soon, and Alison plans to return to her medical career in May. To improve her physical strength, the Delgados spend two hours a day working out with arm bands, treadmills and balance balls. They wear matching Vibram rubber shoes that squish against the gym floor. In one of her exercises, Alison gingerly stands on a rubber balance ball. Her husband protectively leans in, arms extended to catch her in case she falls. "You don't need me anymore," he teases, as she stands tall and maintains her balance. She smiles and pokes him in the chest. He nudges her right back. Video produced by CNN's Jacque Wilson.